The New England Cottontail (Sylvilagus transitionalis), can easily be mistaken for the Eastern Cottontail (Sylvilagus floridanus). Both species are found throughout New England and New York, but the New England Cottontail’s range has dwindled in the last 50 years or so. The Eastern Cottontail was originally not found in New England, but migrated there and now competes with the New England Cottontails. 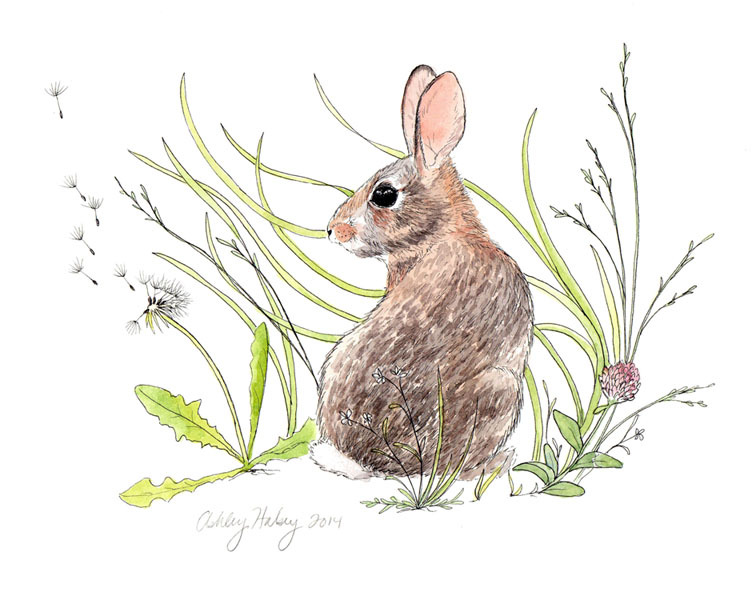 The habitat favored by the New England Cottontail is young forest, which includes brush, shrubs and densely growing young trees. It is nearly impossible to tell these two species apart. The New England Cottontail is distinguishable only by its slightly smaller eyes and body. They also often have a black spot between their ears, they always lack a white spot on the forehead and they have a black line on the front edge of the ear 95% of the time. Limited edition prints, as well as the original of this painting are available on my Etsy shop.